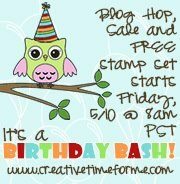 Liz's Paper Loft: My Creative Time Birthday Blog hop & Sale! 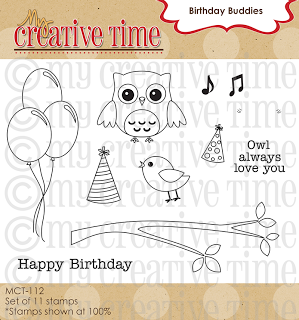 Welcome to My Creative Time's Birthday Bash Blog Hop! We are so excited to help celebrate Miss Emma's Birthday! Just like most birthdays there are presents, not for Miss Emma, but for you! So be sure to read below how you can win some of her presents! lol! You should have arrived here from Miss Leanne's fabbie blog! If you just popped in to see me, you'll want to head to the start at Miss Emma's as to not miss a thing!!! There is a $20 minimum order required to receive free stamp set! Okay, are you all ready for an AMAZING sale as well? For THIS WEEKEND ONLY, please use this code: BDAY42 at checkout to get 20% off of your purchase! You can start shopping HERE! This sale will end on Sunday, May 12th at midnight PST! All orders from this sale will start shipping out on Monday, May 13th~! Last but not least, we have a special guest with us today, Trell! Now your next stop is creative Miss Micia! Super cute cards...love the little banners!! 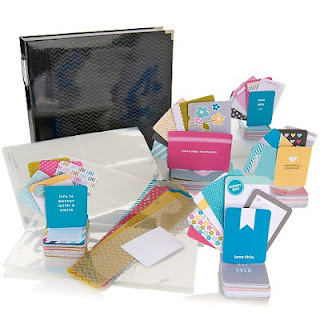 Your card is so fun and happy looking!! I love it! Too cute!! Just love the colors and the banners are adorable! Your card is so gorgeous!!! I love how you used the pennants on the cupcake. It looks yummy enough to eat!! Love the dimension in your card! Always so fun to see what you create. OMG! What a super cute card! 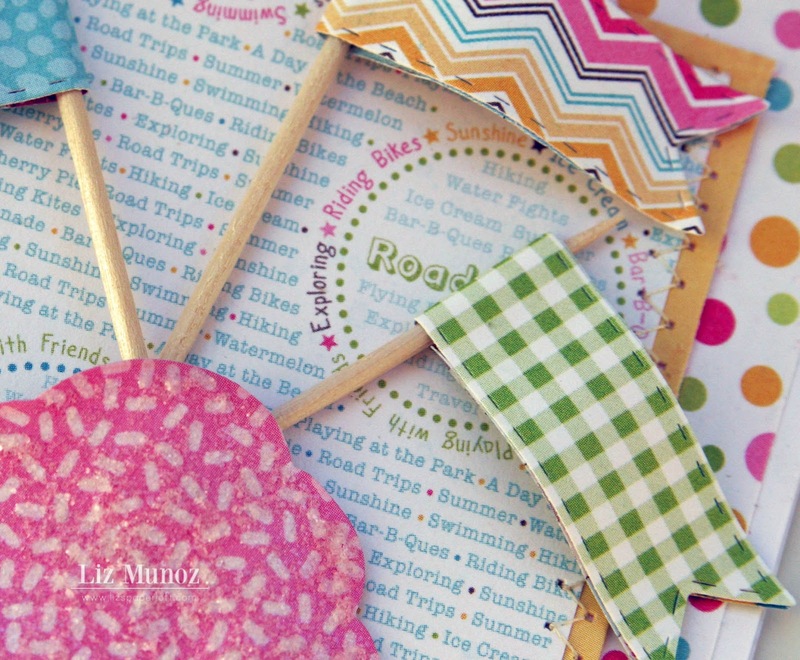 Love the paper choices and those darling little banners! Too cute!!! I love all the flags. What a delicious looking cupcake! Such a cute, fun card!! What a fun card! The flags are so cute. Beautiful and sweet, great combination, thanks for sharing. I absolutely love this card!! It is so festive and just screams "birthday" with every fun detail! I am pinning this so I can recreate it for a birthday card!! Thanks for sharing! Love the fun banners sticking out of the cupcake. I was trying to figure out your background paper. When I first looked at it I suddenly got the inspiration that I could make some paper look like that by using Miss Emma's All Around Circle stamps. Thanks for making me think outside the box. 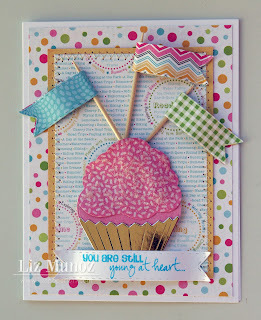 Love the fun colors....great job on your card...just love it!! Adorable card Love the paper and the colors It just screams Happyness!! Liz, your card is absolutely adorable!!! The colors are so pretty, the silver cupcake wrapper looks perfect, and the flags are super cute! Love your flag on top of the sweet cupcake !! So cute !! Very cute and colorful card! Thank you for sharing! 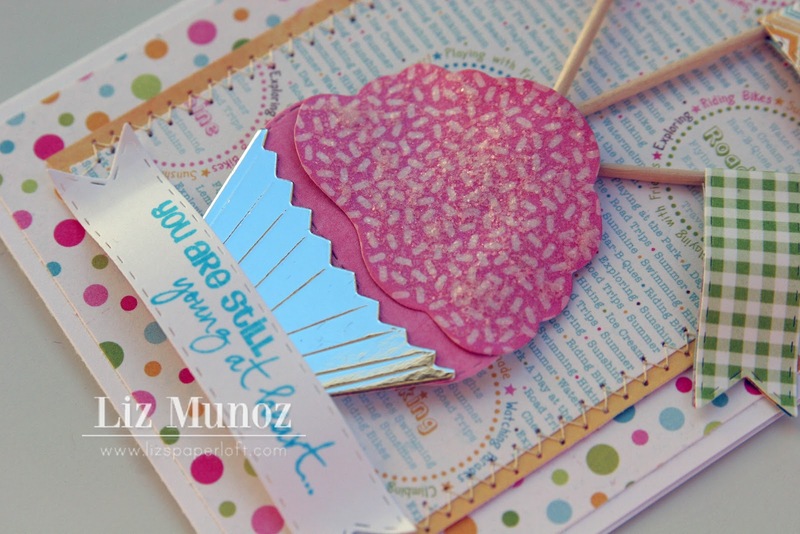 Your cupcake is so awesome just love your card. You did Emma proud....Soooo luvin' the flags what a great idea!! The card is really cute! The banners are a great idea! Cute, the banners are so cute on this card. Oh my goodness Liz, this is so F*U*N! I love, love the papers you used and the design is FABULOUS!!! Have a great day and have a wonderful Mother's Day! What a yummy card. I love the cupcake liner and the sprinkles on the cupcake. I love the sprinkles on the cupcake. Sprinkles are a necessity! Thanks for sharing. I love the card Liz. 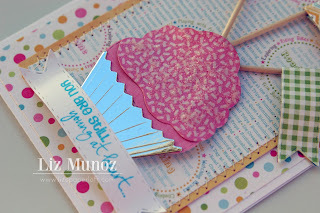 The shiny cupcake paper, cool! The polka dot paper in back is so festive! THanks for sharing! Great card! I love the pretty, bright colours! Very cute with the cupcake flags. Your card looks so yummy--love it!! love this!!! that cupcake is so fun!! Sweet cupcakes! Love the colors you used. Great cupcake! !So pink and beautiful! i love how you added stitching! I love the colors on your card and that cupcake looks good enough to eat! I am going to try to do this card, it's cute (hope I can pull it off)and my little one will think I'm fabulous for doing it! Thank you for putting all the right "touches" on the card to make it stand out! What a great, festive card. Liz ~ OMG we were TOTALLY on the same wave length, but I like yours so much better! 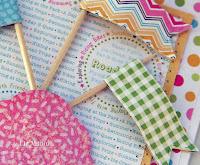 Well the papers are such a awesome choice with the cupcake die and of course the tooth picks too! Cracking up here! I am so glad you like that shiny paper ~ it is my favorite. BEAUTIFULLY done and Happy Mother's Day too! Very cute card!! Love it!! Love the colours & the little banners! What a great, festive card. TFS. Liz, This is super cute!!!! I loved this card! Such great use of colors and loved your design. Such a pretty card, Love those colors and Textures you added. The dimension is perfect my friend. Hope you have a wonderful weekend. Very cute! I love that polka dot paper...and those little flags! Great job, Liz...I love it! Oh my goodness, that cupcake looks good enough to eat! YUMMM!! 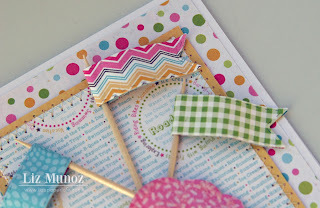 Cute card, love the papers and those banners are perfect! Awesome card Liz!! Love the cupcake and those banners flags are perfect!!! How VERY super cute! LOVE those little banners!!! Really looks like an Emma party wtih all the colors! I like the silver cupcake wrapper and all of the bright papers. Beautiful job! Love the banners and the colors. Too cute! Adorable. This is my favorite paper love the card. Great job. Such a fun card. CUTE! Love the fun colors! Totally made me smile! Such a happy celebratory card..love it!